Inertia's Pamper Parties, offers an affordable alternative to spa pamper days and nights. We bring all the equipment required to perform your treatments including relaxing Day Spa music to set the mood and provide ambience for your guests. Inertia's team of Accredited Therapists, come to you, in the comfort of your Home, or Holiday Apartment. Servicing Brisbane, Ipswich and Gold Coast regions. (eg: can be a mix of 15 min, 30min & 60min treats). Every pamper party, is tailored for you and your guests, individual pampering needs. Including manicures, pedicures, facials, massage, body scrubs, hair treatments and more. Yes, we do provide more than one therapist for longer bookings. Call us today on 1300 700 627, or book online using our, secure online server. We operate 7 days a week, 9am - 7pm (last booking starts). If you would like a later start time, this can be organised. We require a $100 deposit to secure a party time and date. This amount comes off the total. Treatment lists and final payment are due in two weeks prior to party date. If you are booking a party less than two weeks away from the event, full payment and treatment lists are required on booking. Guests remain fully clothed for these mini treatments. Back, Neck & Shoulder Massage - 15min - seated chair massage to relieve sore tired muscles in the neck, back and shoulder regions. Mini Manicure - 15min - Includes, shaping of nails, base coat, two coats of professional polish and quick dry topcoat. Old nail polish must be removed prior to 15min treatment. Mini Pedicure - 15min - Includes, hot towel, shaping of nails, base coat, two coats of professional polish and quick dry top coat. Lower Leg & Foot Massage -15min - Hot towel compress & aromatherapy massage, to sooth tired aching legs, calves & feet. Head & Scalp Massage - 15min - Heavenly head & scalp massage, to dissipate built up tension and stress in the forehead, head and neck muscles. Choose any of the options below. Create your own mix n match pamper party. Back, Neck & Shoulder Massage - A 30 minute aromatherapy back, neck and shoulder massage to soothe away muscle aches and pains. Let your cares melt away as the stress and tension leaves your body. Finished off with a hot towel to remove excess oils. Express Spa Facial - 30mins - A basic maintenance facial which cleanses & refreshes your skin. Includes a double cleanse, exfoliation, nourishing clay mask (removed with hot towels), and moisturiser. While your mask is on, enjoy a soothing hand & arm massage or heavenly head & scalp massage. Anti-Ageing Collagen Firming & Moisturising Face Treatment - 30mins - Accelerates skin metabolism and reinforces skin growth by taming & smoothing out fine lines. With 100% natural collagen protein it enhances the skin's moisturising function and provides the skin structure with new energy. Treatment includes a double cleanse, silk collagen face mask, collagen serum is also massaged into neck & decolletege. While mask is on, enjoy a heavenly head & scalp massage (or hand & arm massage). Mask is removed and excess serum is massaged into skin. You will feel & notice an incredible difference to your skin. A great pick me up before a special event. 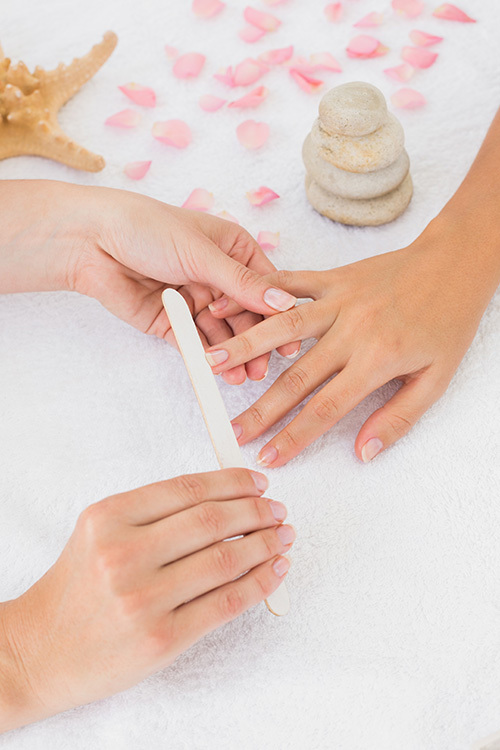 Express Manicure - 30mins - Relax & enjoy a hand soak in aromatherapy oils. Your nails are trimmed, shaped, buffed, cuticles groomed,hands are massaged. Followed by your choice of professional polish, quick dry topcoat, or buffed " au naturel". Nourishing cuticle oils are applied at the end of treatment. Express Pedicure - 30mins - Lay back and enjoy, a foot soak, in mineral rich sea salts. Trim, file, & buff of your nails, cuticles tidied,feet are massaged. Followed by your choice, of professional nail polish & quick dry topcoat. Nourishing cuticle oils are applied at the end of treatment. Foot & Leg Revival - 30mins - Enjoy an Aromatherapy foot soak and soothing foot & leg massage. Lay back and experience True Bliss. Back Exfoliation & Massage - 30mins - Your back is exfoliated with the richness and goodness of the sea. Exfoliates away, dead skin cells, revealing new fresh, softer, healthier skin. Hot towels are then used, to steam away excess scrub, from your skin. Finishing off with a massage using a delicious blend of body butter. Nourishes thirsty skin. “Pure Bliss” Spa Hair Treatment - 30mins - A very popular treatment, for adding shine and lustre, to your hair. Your hair is dampened & treatment is applied to your hair, followed by a relaxing, head & scalp massage. Treatment is combed through and removed with hot towels. Will totally relax & unwind you. Full Body Relaxation Massage - 1 hour - An aromatherapy, full body massage. Relieves muscular tension, improves circulation and eliminates toxins from the body. Deluxe Spa Facial - 1 hour - Consisting of a double cleanse, exfoliation, face, neck and decolletege massage, clay mask (removed with hot steamed towels), heavenly head & scalp massage and moisturiser. Spa Pedicure - 1 hour - Enjoy a luxurious foot soak in, mineral rich sea salts. Nails are trimmed, filed & buffed, cuticles groomed. Followed by a stimulating foot and lower leg exfoliation. Heavenly foot and leg massage to relieve tired aching feet & legs.Finished off with your choice of professional nail polish and quick dry topcoat. Nourishing cuticle oils are applied at the end of treatment. Spa Manicure - 1 hour - Give your hands and arms the attention they deserve. Start with a soak in aromatherapy oils. Your nails are trimmed, shaped, buffed and cuticles groomed. Your hands & arms are exfoliated and hot towelled, revealing fresh healthier skin. Enjoy a soothing hand & arm massage. Followed by your choice of professional nail polish & quick dry topcoat. Nourishing cuticle oils are applied at the end of treatment. Full Body Exfoliation, Body Butter & Back Massage - 1 hour duration. A full body exfoliation using mineral rich sea salts, body butter and back massage. How do I book, my Pamper Party? Step 1: Arrange a date, time and place to hold your Pamper Party with your friends. Step 2: Invite Inertia Day Spa by emailing us at info@inertiamassage.com.au or call us on 1300 700 627, to discuss your requirements. (Alternatively, you can use our online booking form to book a date and pay your deposit online). Step 3: When you make an enquiry for an available date and time or pay your deposit online, you will then be contacted by us to co-ordinate, and plan your special event. Step 4: A deposit of $100 will be required on booking to hold required date. Balance becomes due 14 days prior to party date. Confirmation letter and schedule of treatments will be emailed 7 days prior to party date. We require a minimum booking of 2 hours per Therapist for Inertia Pamper Parties. Inertia's Massage & Beauty Therapists are fully accredited and insured professionals. Yes, we do provide more than one Therapist for larger bookings. As per Inertia's Terms & Conditions of trading, customers are required to pay hotel car parking fees on the day (or pre-organise parking), for Therapists attending bookings. We look forward to spoiling you soon!